Sometimes what you think is a bad thing turns out to be good after all. Getting up at 6 o’clock in the morning to walk 25.2 km. doesn’t sound like something most people would want to do. When you stay in an albergue and share a dormitory with thirty people, that’s exactly what you do. The first person wakes up early and the zipping and unzipping of their backpack is your “alarm clock.” Today we were glad of the early start. It was going to be a fantastic day! We left the albergue in Castrojeriz just after 7 o’clock when it was still dark, following the two peregrinos in front of us who were wearing head lamps. On the way out of town, we joined a track that runs alongside a Roman causeway. The sky was gradually getting lighter and we could see ahead that the track was leading directly towards a steep hill. The top of the hill is Alto Mostelares, 90 metres higher and 3.4 km. 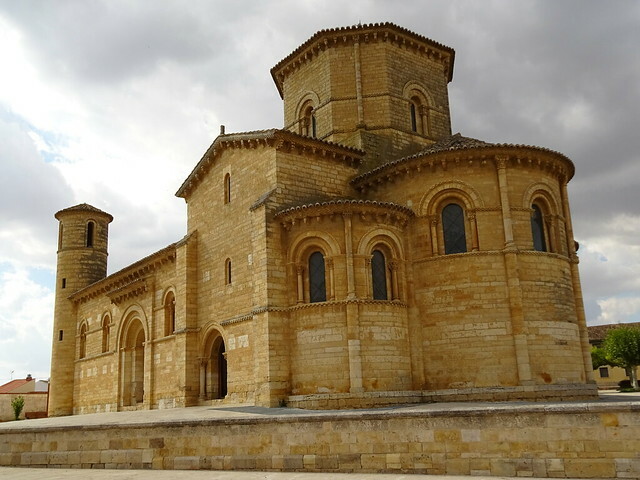 away from Castrojeriz. It was a strenuous climb, but there was a welcome rest area at the top of the hill, a big stone cross and another smaller, embellished one. The real “masterpiece” at the top of the hill, though, was the sunrise. What perfect timing! The land at the top of the hill was flat as a pancake but, eventually, what goes up the hill comes down the other side. The scenery was spectacular all the way to Boadilla, 15.8 km. from Alto Mostelares. 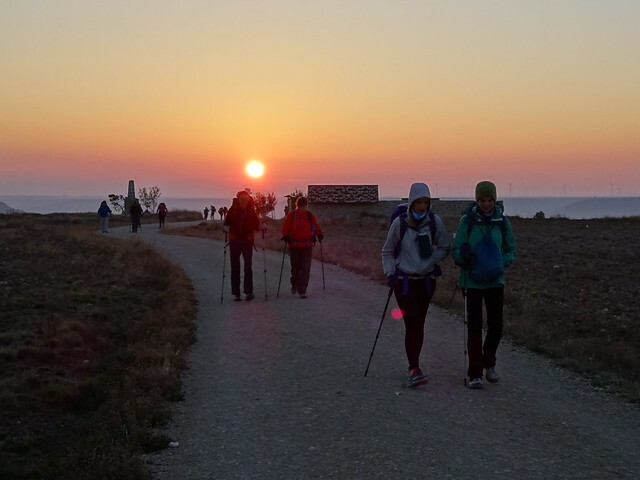 This has got to be one of our favourite days of walking the Camino. Once in Boadilla, we checked out the popular En El Camino albergue with the beautifully landscaped grounds, small swimming pool, and walls painted by artist Begona. We would have stayed there, but after sharing big dormitories with many peregrinos for the previous three nights, we were in the mood for a hotel room with a private bath once again. Unfortunately, all En El Camino had available were 48 beds in two dormitories. The next town, Fromista, was our only choice if we wanted a hotel, so off we went. 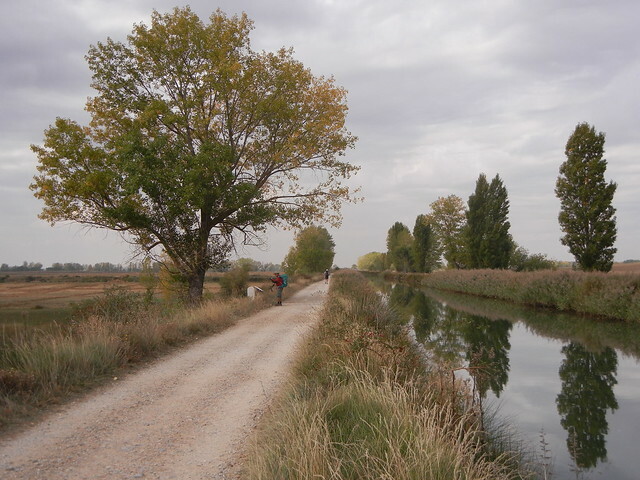 We continued out of Boadilla onto another farm track through the Tierra de Campos (Land of Fields) to the Canal de Castilla. The canal flows all the way into Fromista along a peaceful tree-lined path. This 18th century canal provided transportation of the cultivated crops as well as power to turn the corn mills. Now its use is restricted to irrigation and leisure. After walking 25.2 km. from Castrojeriz, we finally reached Fromista. We thought we’d gone to Heaven when we checked into the San Martin Hotel, but “beauty is in the eye of the beholder.” A couple from Minnesota that we had met the previous evening were disappointed with their room which is exactly like ours. John said it was so small he wouldn’t be able to swing his golf club without hitting something. The difference is that they have stayed in hotels during their entire journey, and this one didn’t measure up to the others. We have spent many nights in albergues so have come to appreciate even the smallest of luxuries. This just goes to show how, in our Western society, we tend to take so much for granted and complain if we don’t get them. 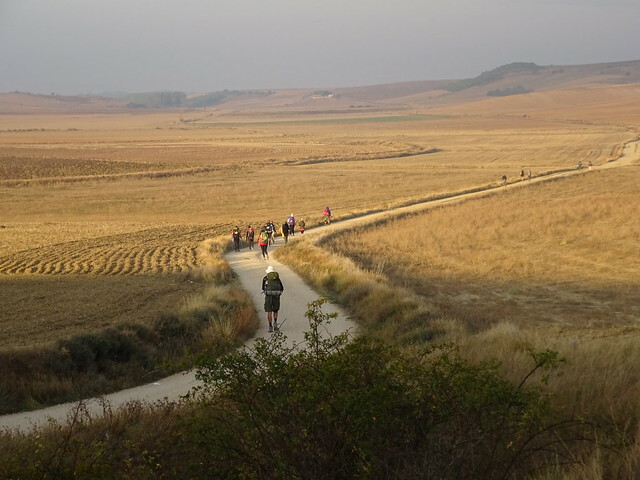 This is one more lesson, thanks to the Camino. 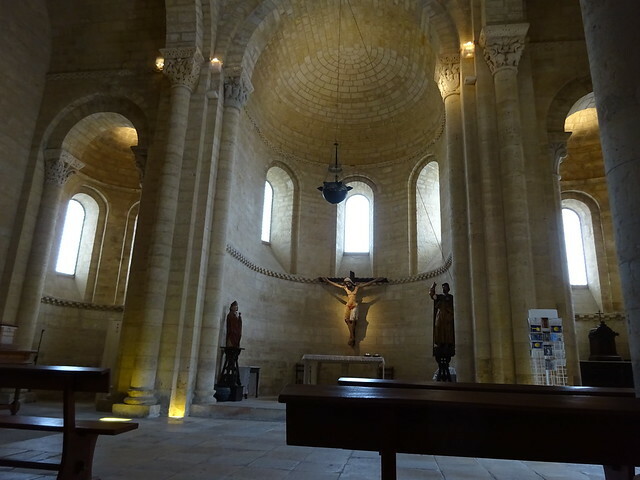 Fromista is best known for the beautiful 11th century Iglesia de San Martin and one of the finest examples of pure Romanesque in Spain. There were several pilgrim hospitals in Fromista in medieval times. The name, Fromista, is derived from the Latin word for cereal (frumentum) because this is where the burgeoning Roman Empire got their wheat. 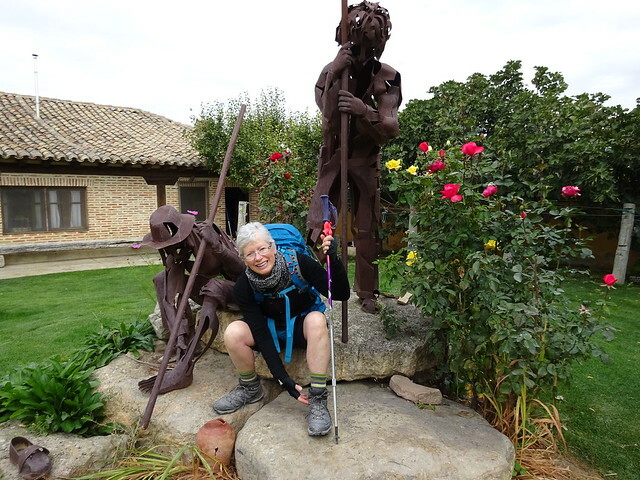 Back to the beginning of our day at the albergue in Castrojeriz, I met a fascinating five-time Camino-walker from Arizona, Elaine. 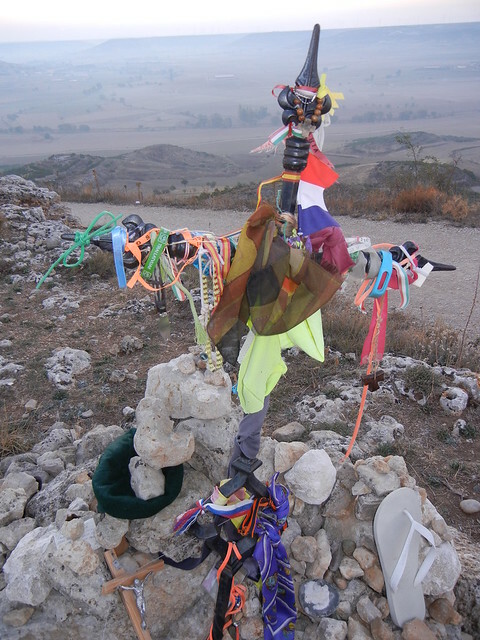 When she first walked the Camino in 2008, she came home feeling more “alive” than she’s ever felt. 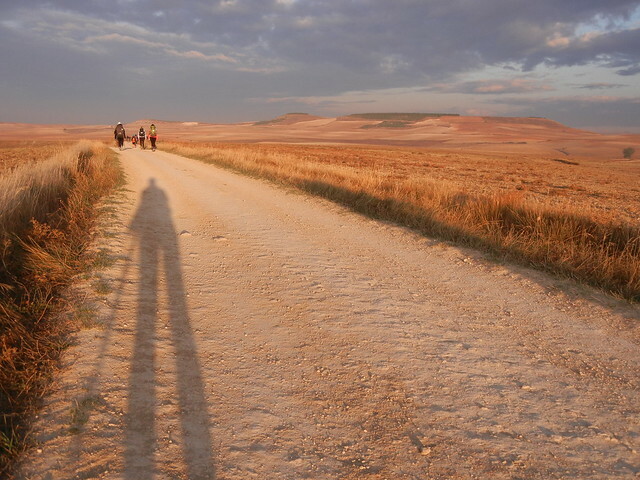 That feeling of “aliveness” diminished gradually until, after a year, she felt the need to go back and walk the Camino again to recapture that euphoric feeling. That need kept repeating itself. 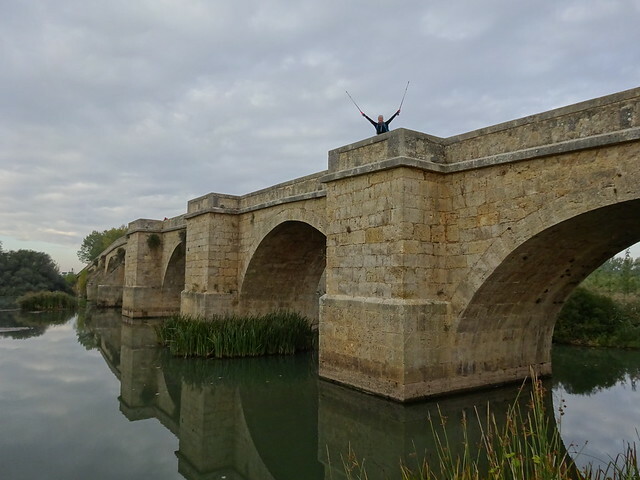 When she walked the Camino the first time, she never would have guessed it would become an addiction, but it has. Yes, you can do it. You have already traveled for 23 days!!!! The pictures of the country side remind me of my farm upbringing. “Manual of Politeness”, no tree to hide behind, that would be a problem for me. Some people have lost all inhibitions, but we have yet to embarrass ourselves (thank God)! Actually, I can now see why people like to walk the Camino over and over again. When all you do is walk, eat, sleep, repeat life can be simpler and our minds can become less scattered. I’ve still got lots to learn about that, though, because it is hard to change that old way my mind goes off on a tangeant like a wild elephant. Maybe another long walk is what I need? Greetings from North Saanich. Chadow and I have had a blog binge today and read all your posts. What a great adventure and you are over halfway!!! Great pics, mostly good weather and food sounds good. Today as part of the N. Saanich Jubilee celebrations we had lunch and 2 speakers at the Deep Cove Chalet – wine, crusty warm home-made bread, duck broth, a seasonal produce salad, curry scallops & rack of lamb (we shared both entrees) and a pear tart with ice and whipped cream and coffee in a beautiful setting on a gorgeous day. Just a “taste” of home for you. I’m sure you and Dave will have many stories to tell. Will try to keep up with the blog. Your lunch sounds amazing! Last night our pilgrim menu choices were: (primero) salad or lentil soup; (secondo) pork steaks and fries or stewed chicken and fries; (dessert) flan or ice cream. There has never been a dinner without fries. We’re not quite half way there, but will be within 2/3 days I think. Rain is predicted so we might hang around so we can enjoy the scenery while walking in the sunshine.